I’ve struggled with my skin for years. I have sensitive skin that is acne prone – leaning more towards the dry side but that can also get oily in my T-zone. Harsh acne fighting regimens like Proactive did nothing but burn like hell and turn my skin into the Sahara desert – a state which happened after only a couple of uses and took a long time to recover from. This means I have to be really careful about the skincare products I use. My pores can get clogged up easily, causing more future breakouts. It doesn’t help that most days I’m wearing a full face of makeup, either. But I love makeup, and I wasn’t willing to give up wearing it. I’ve long been searching for the perfect skincare routine that works for me, and now that I’ve been using this routine for over a month, I can safely say my results are not a short-term fluke, so I thought I’d share it. For full disclosure, I should also add that I’ve improved my diet and have been trying to sleep more, exercise more, and drink more water, so those are factors, too. I’ve also been drinking Tiny Tea which helps my skin stay clear. 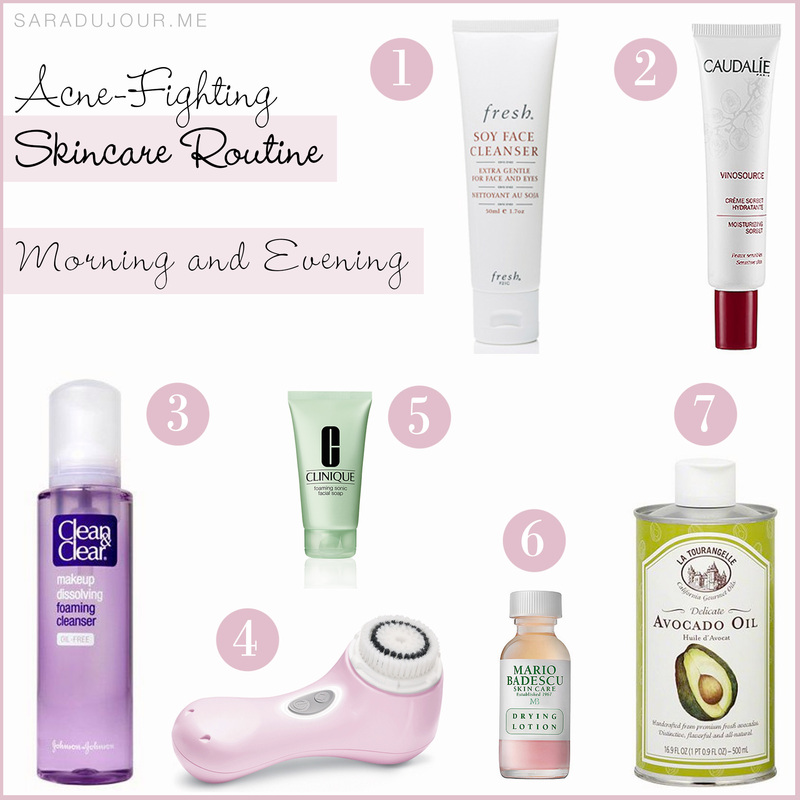 I have a morning skincare routine and a nightly skincare routine, which is more extensive. I’ve going to start by describing what I do at night, because that actually informs what I do the next morning. 1. The first thing I do is take off my makeup. I either wear no makeup at all or a lot of makeup (i.e. liquid foundation, powder, the works) so I need to make sure I cleanse my skin properly. 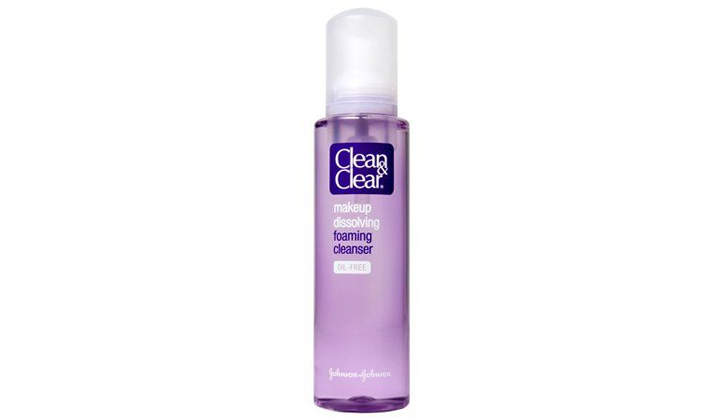 I love this Clean & Clear Makeup Dissolving Foaming Cleanser because I just pump it onto my hands and rub it all over my face – and it gets almost everything off. (I wear waterproof mascara, so I use Clean & Clear Soothing Eye Makeup Remover for that.) To make sure I get all the makeup off my skin, I do two rounds of this foaming cleanser, rinsing my face off in between. 2. Now that my face is makeup-free, it’s time to deep clean my pores. I pump some more of the Clean & Clear Foaming Cleanser on my Clarisonic Mia and go all over my skin. Not only does it scrub out my pores, it feels really great, like a gentle facial massage. 3. Sometimes instead of using my Clean & Clear cleanser on my Clarisonic Mia, I use this Clinique Foaming Sonic Facial Soap instead, which is specifically designed to be used on a sonic brush. It’s a creamy formula, so it helps it gently glide across your skin. 4. Now that my skin is squeaky clean, it’s time to moisturize. I’ve tried a million and one moisturizers, from high end to drugstore, but there is nothing my skin loves better than this. 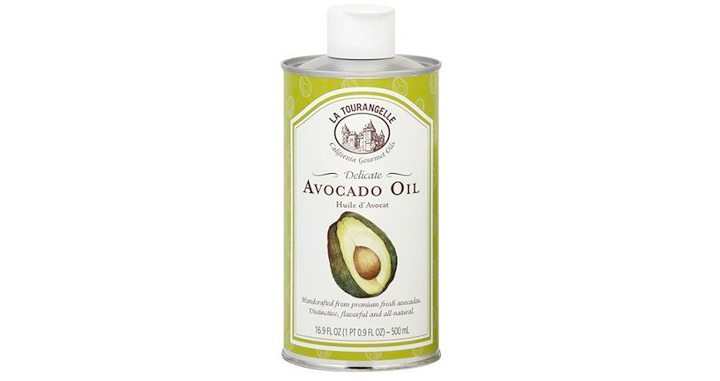 Pure avocado oil is all natural, won’t clog your pores, and is the perfect thing to apply before bedtime so your skin can soak up its goodness overnight. I use this all over my face and even under my eyes, in place of an eye cream. When I wake up my face is no longer oily, just hydrated and silky smooth. For a while I was actually afraid of moisturizing, because I thought that would just cause me to break out more. By skipping this step and keeping my skin dry, I actually forced my skin to overproduce its own oils to try to compensate, which made me break out more. Don’t be afraid of oil! 5. If I have a breakout or two, I’ll handle them overnight with my Mario Badescu Drying Lotion. I apply it on any spots I see with a cotton swab, and let the product dry them out, heal them, and reduce their redness overnight. It really works. Though the spots won’t have magically disappeared completely by morning, they’ll look less angry and your acne will go away much quicker. In the mornings I am very sleepy and still half-zombie, so there is no way I’m jumping through any hoops for my skin. I only use two products that require two minutes each…because I am no early bird and ain’t nobody got time for that. 1. Since the skin produces oils overnight, and your pores are secreting all kinds of things, it’s important to cleanse your face from all of that in the morning. If I’ve used the Mario Badescu Drying Lotion the night before, I need to rinse that off, too. I use my Fresh Soy Facial Cleanser all over my face to quickly cleanse it. This stuff is really gentle and safe for your eyes, which is good for when you accidentally get it in your eyes because you’re so tired. 2. 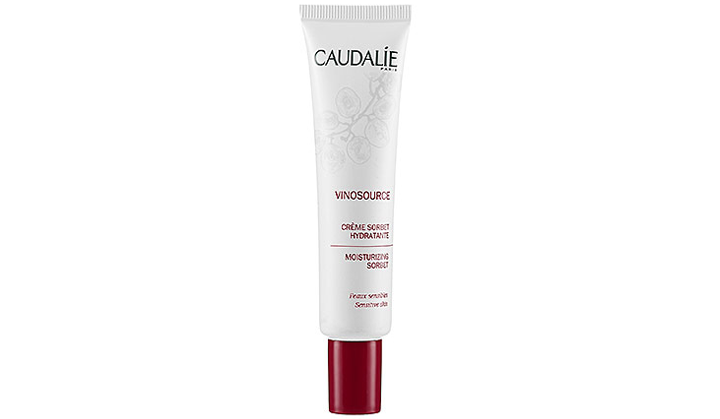 Now that my skin is fresh for the day and I’m about ready to put on my makeup, I apply a pea-sized amount of this Caudalie Moisturizing Sorbet all over my face and under my eyes to hydrate and give my foundation and under-eye concealer a great base. This stuff is ultra light and non-greasy, meaning it soaks up in minutes and won’t interfere with your makeup. It’ll make your skin look more plump and help prevent makeup from settling into any fine lines. All of these products sound amazing! Especially the avocado oil!